Agriculture is the study of plants in relation to field crop production. Agronomy is the science of crop management and includes the study of soils. Horticulture is the science of growing fruits, vegetables, flowers, and other ornamental plants. Botany is the science that studies all phases of plant life and growth. A thorough understanding of botany is necessary to understand the other plant sciences. Master Gardeners need botanical knowledge in order to use correct terminology when referring to plant parts and plant identification and to understand why and how plants live, grow, and respond to their environment. Plant physiology deals with the functioning, their mechanisms of response, and the physical and biochemical processes of plants. Morphology deals with the origin and function of plant parts while anatomy considers plant structures. Taxonomy deals with plant classification and naming. Plant ecology is the study of the complex relationships of plants in biological communities. Plant geography studies the distribution of plants throughout the world. Plant pathology is the study of plant diseases. Plant classification and the scientific naming of plants help us identify plants exactly. The plant classification system groups plants with similar characteristics together and then creates sub-groups with more similar characteristics. Within those subgroups more subdivisions or groupings are made by getting even more specific. This process continues until a single plant with unique characteristics is named. Master Gardeners usually work with the classification of plants at the family level and below. The common names of plants are often not precise enough to identify them exactly. Sometimes a common name refers to two or more entirely different plants. Only scientific nomenclature allows an exact understanding of which plant is being discussed. In a family of plants, similarities occur primarily among its members' flowers but also leaves and other plant parts. For example, the rose family, Rosaceae, includes members of the genera Rosa (rose), Malus (apple), Prunus (plum), Frageria (strawberry), and many others. They all have similar flowers with five petals and many stamens. Some other large families are Asteraceae (sunflowers), Ranunculaceae (buttercup), Poaceae (grasses), and Fabaceae (pea and bean family). Genus is a subdivision of family and the plants of the same genus share similarities mostly in flower characteristics and genetics. Plants in one genus usually cannot breed with plants in another genus. Species is a group of individual plants interbreeding freely and having many (or all) characteristics in common. A plant growing in the wild within a species that is different in some particular characteristic from other members of that species. A variety, when grown from seed, will maintain all of its particular characteristics. This word is a contraction of cultivated variety. Propagation of cultivars results in little or no genetic change in the offspring, which preserves desirable characteristics. If propagated asexually or vegetatively, culti-vars are termed clones, and if propagated by seeds they are termed lines. Seeds of clones will not produce plants with the same desirable characteristics as the cultivar. Cultivars are generally selected by botanists and horticulturists and maintained under cultivation. A hybrid results from a cross between two different species or well-marked varieties within a species. Hybrids grown in a garden situation will not breed true-to-form from their own seed. For example, supersweet hybrid corn cannot be reproduced by saving seed from this year's crop. The seed will produce a different type or several different types of corn, but none will have all the characteristics of the original hybrid plants. The genus, species, and variety names appear either in italics or underlined. The first letter of the genus name is capitalized; but the species and variety are written in all lower case letters. Cultivars are indicated by placing the cultivar name in single quotation marks or by preceding the cultivar name with the abbreviation cv. (do not use both). The first letter of the cultivar name is capitalized, but the name is not italicized or underlined. An example is the Colorado blue spruce, Picea pungens 'Glauca' or Picea pungens cv. Glauca. Hybrids created intentionally, or by crossing in nature (natural interbreeding), are designated with an "x" between the genus and species. An example is Forsythia x intermedia, which is a cross between F. suspensa and F. viridissima. A binomial name is a plant's genus and species and may be followed by the initial of the authority for describing and naming the plant. For example, Solanum tuberosum L. indicates that Carl von Linne (Linnaeus), a Swedish physician, described and named the white (Irish) potato. Linnaeus proposed a system of nomenclature for plants in 1732 based primarily on flowers and/or reproductive parts. This system has persisted to the present day. Plants are also classified by life cycle (e.g., how long it takes a plant to develop from a seed to a flowering plant). Annuals are plants that grow, mature, flower, produce seed, and die all in one season. Zinnias are annual plants. They complete their life cycle in one year. Biennials take 2 years or a part of 2 years to complete their life cycle. During the first season, biennials grow as a vegetative plant that overwinters as a hardy rosette of basal leaves. During the second season, the plant flowers, produces seeds, and then dies. Parsley is an example of a biennial plant. Perennials live for more than 2 years. Herbaceous perennials have soft, non-woody stems while woody perennials have woody stems. Woody perennials can either keep their leaves through the winter (evergreen) or lose them and grow new leaves in the spring (deciduous). Tender perennials die back each winter and a new plant grows from the roots each spring. Leaves—Leaves arc the photosynthetic (food manufacturing) organs that produce carbohydrates to provide energy for the plant to live and grow. Leaves are also a site of respiration, which is the process by which carbohydrates are converted into energy. Another function of leaves is transpiration, or the loss of water as vapor. Transpiration helps to regulate leaf tempera ture and helps to carry water up the plant from the roots. Parts of a leaf: Leaf parts include the blade, the flat thin part, and the petiole, which attaches the blade to the stem. The pattern of attachment of leaves to the stem is opposite, alternate, or whorled. Leaf arrangement is an identifying feature of plants. There are two common leaf classifications: simple, a single leaf, or compound, a leaf with two or more leaflets (Fig. 1). Leaf shapes, edges (margins), tips, bases, and vein patterns also have specific terminology used to describe these characteristics (Fig. 2). Fig. 1. 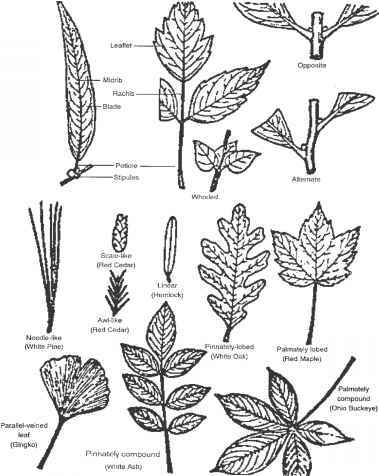 Parts, types, and positions of leaves. b. 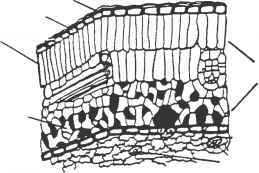 Leaf structure: Several layers of cells make up the leaf blade. The outer cell layers on top and bottom are the epidermis. They serve as protection for the inner leaf tissue. Some plants have hairs called trichomes that are extensions of the epidermal cells. A waxy layer on the epidermis is called the cuticle. It protects the leaf from dehydration and prevents penetration of some disease-causing organisms (Fig. 3). Fig. 2. 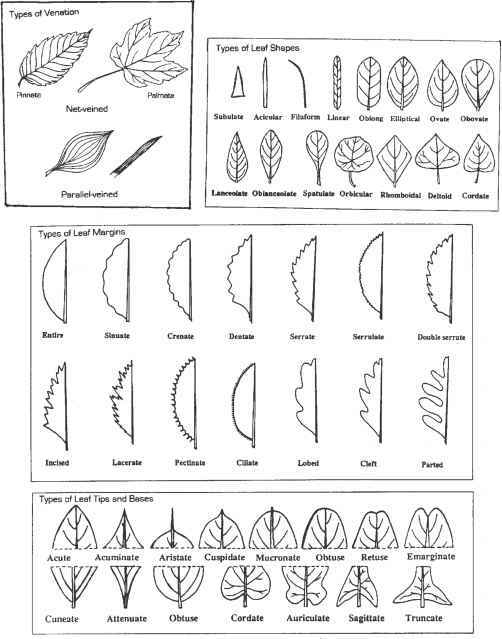 Terminology describing leaf characteristics. Fig. 4. Functions of the leaf. Fig. 5. Parts of the stem. Chapter 2, The Idaho Master Gardener Program Handbook. 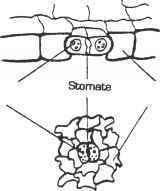 Carbon dioxide enters the leaf through the stomata. Photosynthesis requires natural or artificial light and water that comes through the roots. The photosyn-thetic process occurs in the chloroplasts that contain the chlorophyll cells. Oxygen and water are released through the sto-mata, and the end products, carbohydrates, are converted to sugars and starches for transport and storage throughout the plant. Leaves are also one site of respiration in the plant. Respiration is the process by which carbohydrates are converted into energy. This energy builds new tissues, maintains the chemical processes, and allows growth within the plant. With this production of energy, sugars and oxygen are converted to carbon dioxide, water, and a small amount of heat. Respiration occurs in all cells and at night as well as during the day. The loss of water through the leaf sto-mata is called transpiration. The transpired water comes from the photosyn-thetic process and also from water in the cells. Transpiration pulls water from the roots with dissolved nutrients through the plant. It also provides evaporative cooling for leaf tissue. Stems—The stem of a plant supports the above-ground plant parts and is a pathway for water, nutrients, and carbohydrates. develop into leaves or flowers at a node. The area between nodes is called an internode. Internodes can be lengthy or very small depending on the genetics of the plant and environmental conditions. b. Types of stems: Crowns are compressed above-ground stems. Examples are dandelions and strawberries. The leaves and flowers are on very short internodes. Spurs are short, stubby stems common on fruit trees such as apples and pears. These spurs produce the fruiting buds on these trees. A stolon is a horizontal stem, either fleshy or semi-woody, that runs along the soil surface. An example is the stem that attaches the strawberry plant to its plantlets. It is also called a runner. 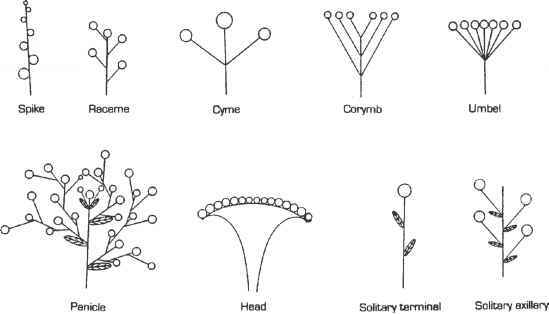 Some types of grass form stolons. Below-ground stem variations include tubers (potatoes), rhizomes (bearded iris), tuberous stems (tuberous begonias), corms (crocus), and bulbs (tulips) (see Chapter 18, "Herbaceous Ornamentals"). c. Internal structure of the stem: The vascular system inside the stem transports water, minerals, and sugars (Fig. 6). The xylem vessels conduct water and minerals, and the phloem tubes carry sugars. 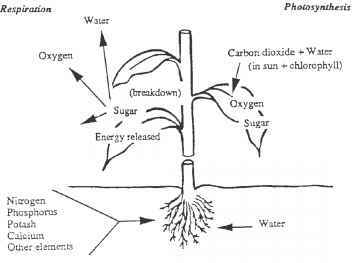 Water moves primarily from the roots to the top of the plant. Sugars move from areas of manufacture or storage to use or to other storage areas in the plant. The arrangement of the vascular system in a dicot is continuous. It forms rings inside the stem with the phloem near the outside, or bark, and the xylem toward the inside (Figs. 6 and 7). In monocots, paired xylem and phloem form bundles that are scattered throughout the stem (Fig. 6). 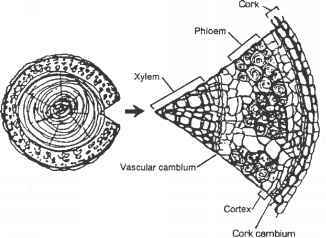 Between all functional phloem and xylem is a layer of cells called the cambium. These cells divide and produce xylem toward the inside of the stem and phloem toward the outside of the stem. Stem girth of woody perennial plants increases mainly by the activity of these cambium cells. d. External structure of the stem: In nonwoody plants the epidermis, or outer single layer of surface cells, protects the stem. As in leaves, this layer is usually cutinized, or waxy, and on young stems it has stomata. Below the epidermis are layers of supporting and strengthening cells that surround the vascular tissue (Fig. 7). These cells may contain chloroplasts so that they can photosynthesize. Some of these tissues can divide and form new tissue when wounded, providing a protective mechanism for the stem. Woody plants form bark, or cork, on the outside of their stems. Cork cambium produces this bark and is located just below the bark layers (Fig. 8). Fig. 6. Vascular system arrangements. Fig. 7. Cross section of a herbaceous dicot stem. Fig. 8. Cross section of a woody stem. This cambium forms cork, or bark cells, that become coated with water resistant materials, die, and build up into a thickened, protective layer. The bark cells resist desiccation, disease, insects, and extreme temperatures. Only dicots produce the type of growth depicted in Fig. 8. On young twigs and small trunks of many kinds of trees and shrubs, lenticels, or pore openings, allow the outward and inward movement of gases. Buds—A lateral or axillary bud is an undeveloped shoot or flower that is found at the node. If the bud is at the tip of shoots, it is called a terminal bud (Fig. 9). Buds may continue to grow after they are formed, or they may stop growing and remain dormant until the following spring. Buds on many plants require a certain duration of cold temperature below a certain degree before they will grow in the spring. During dormancy, buds can tolerate very low temperatures without damage. However, once the plant has had enough cold temperature to satisfy that requirement for growth, a new bud can be easily damaged by subsequent cold temperatures. Non-growing buds of tropical and subtropical plants do not have a temperature requirement for growth. Types of buds: Vegetative buds develop onto shoots, flower buds produce one or more flowers, and mixed buds produce both shoots and flowers. Buds that do not grow for long periods of time can become embedded in the enlarging stem tissue and are latent buds. These buds grow only when conditions necessary for their growth occur, such as drastic pruning. Not all plants have latent buds. Adventitious buds develop in locations that buds usually don't occur. An example is the buds found on root pieces used for propagation; roots do not have buds. Underground parts that do have buds are considered underground stems, such as rhizomes or tubers. 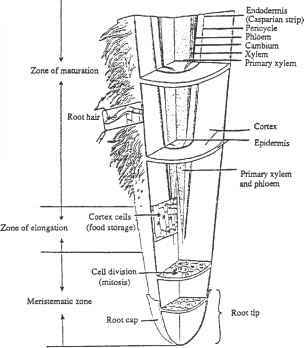 Roots absorb nutrients and moisture, anchor the plant in the soil, furnish physical support for the stem, act as transport systems to move water and minerals to the stem, and serve as food storage organs. Roots profoundly affect the size and vigor of the plant, method of propagation, adaptation to soil types, and responses to cultural practices and irrigation. Roots make up a large proportion of the total plant; about 20 to 30 percent of the total volume of the plant is roots, depending on the nature of the root and the growing conditions. Since individual roots may be so small, however, roots can account for up to 90 percent of the surface area of a plant! root penetrates the soil (Fig. 10). Most water absorption occurs in the area of the root hairs. The internal structure of roots is different from stems. A root cap protects the root as it pushes through the soil. The cells of the cap slough off and are replaced by others as roots grow downward. The epidermis protects the root surface, contains the root hairs, and is responsible for the absorption of water and minerals dissolved in water. Cortex cells, beneath the epidermis, help move the water from the epidermis and are active in food storage. The vascular tissue (xylem and phloem) is in the center of the root and conducts nutrients, sugars, and water. b. Kinds of root systems: After the primary root emerges from the seed, it may continue to grow straight down and become a tap root, or it may branch, forming secondary roots, and become a fibrous root system with many side, or lateral, roots (Fig. 11). The taproot can be encouraged to branch by removing or breaking the apical root meristem, or growing point of the root. This often happens when seedlings, trees, and other plants are transplanted. This process favors a fibrous root system. Many of the functional feeder roots of woody plants extend only into the top 18 inches of soil. The depth that tree roots penetrate depends on the types of tree and soil, and water status. A dense compacted layer in the soil or a high water table will restrict or terminate root growth. Types of roots: Some unusual roots are aerial roots, which develop on stems above ground. If they reach soil they will become ground roots. The aerial roots of some orchids contain chlorophyll for photosynthesis and absorb moisture and nutrients from the air. Adventitious roots are those that form at any place on the plant other than the primary root system. They may arise from cells adjacent to vascular bundles, cambium, or young phloem cells. They also form on other plant parts besides stems, such as leaf petioles or leaf blades or even on older root pieces. 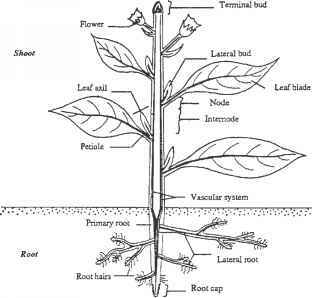 The ability of many plants to produce adventitious roots allows the propagation of plants vegetatively. Plants reproduce in many ways, from a simple cell splitting into two identical individuals (clones) to the complicated floral structures found in higher plants. Gymno-sperms (conifers) have a reproductive system that differs from angiosperms (flowering plants). We are concerned here with the most highly evolved reproductive system, that of the angiosperms or flowering plants. 1. Flowers—Flowers are the specialized plant structures adapted for sexual reproduction in plants. After fertilization by pollen, parts of the flower develop into a fruit that bears the seed(s). Formation of flowers is still poorly understood. Flowering may be caused by a stimulus such as day length, plant age, temperatures, stress, and other factors. a. Parts of the flower: Complete flowers have four parts: sepals, petals, stamens, and pistils, which are all borne on a receptacle (Fig. 12). • Sepals are the outer covering of the flower when it is in the bud stage. They are leaf-like in structure and are usually green, however, they can be colored and look like petals, as in tulips. They may fold back as in roses or remain upright as with carnations. Together, all the sepals form the calyx. The petals are the floral structures inside the sepals. Together, all the petals form the corolla. Petals are usually brightly colored and often contain nectaries that secrete nectar. The color and nectar attract insects to pollinate the flowers. Collectively, sepals and petals form the perianth. The stamen is the male part of the flower and is inside the petals. Each stamen consists of a filament tipped with an anther. The anther produces the pollen. The pistil is the female component of the flower. It is in the center of the flower and has three parts: the stigma, the receptive surface that receives the pollen; the style, a tube connected to the stigma; and the ovary, attached to the lower end of the style. 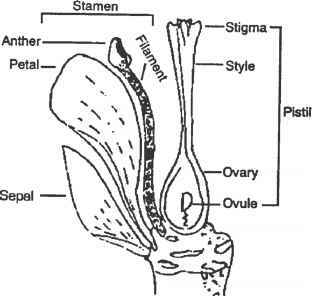 The ovary contains ovules that develop into seeds after pollination and fertilization have occurred. b. Types of flowers: A complete flower has all four parts: sepals, petals, stamens, and a pistil. Flowers with both stamens and pistils are called perfect flowers. Incomplete flowers lack one or more of the four parts. Flowers with no pistils (stamens only) are staminate or male flowers. Flowers with no stamens (pistils only) are pistillate or female flowers. These flowers are called imperfect because they lack either the pistils or the stamens. If a plant has imperfect flowers and male (staminate) and female (pistallate) flowers occur on the same plant, the plant is termed monoecious. Corn is an example of a monoecious plant. If the male and female flowers occur on separate plants the plants are called dioecious. Holly is an example of a dioecious plant. Arrangement of flowers: If a stalk bears a single flower, such as a tulip, it is a solitary flower. Multiples or clusters of flowers are arranged in inflorescences. Some of these flower clusters are shown in Fig. 13. Fig. 14. The process of fertilization. Fig. 13. Types of inflorescences. tion occurs when sperm unites with the egg and an embryo begins to grow. A plant is self-fertile if it produces seed with its own pollen. It is self-sterile if it needs pollen from another species, variety, or cultivar (e.g., cross-pollination) for fertilization to occur. 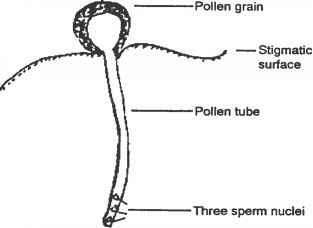 Often self-sterility is due to incompatibility or a condition where the pollen will not grow through the style. 2. Fruits—Once pollination occurs and the embryo begins to develop, the formation of a fruit begins and seeds develop within the fruit. Fruits can develop from all the various parts of the flower, not just the ovary. Fig. 15 shows some fruit types. a. Fruit growth and development: Botani-cally speaking, the true fruit is just the enlarged ovary. However, once fertilization is accomplished, the true fruit and, sometimes, various associated tissues begin to grow into what we recognize and call a fruit. Food materials move from other parts of the plant into these developing tissues. Hormonal chemicals are involved in fruit growth, but their basic mechanisms are not completely understood. Fruit growth includes both cell division and cell enlargement. Botanical maturity of a fruit refers to a final stage of development when the fruit is still on the plant and cell enlargement and accumulation of carbohydrates and other flavor constituents is complete. Fruits are often harvested before true botanical maturity as in the case of cucumbers used for pickles. Fruits, such as lima beans used as dry beans, are harvested after true botanical maturity. Optimum harvest time depends upon the intended use of the fruit. Fig. 15. 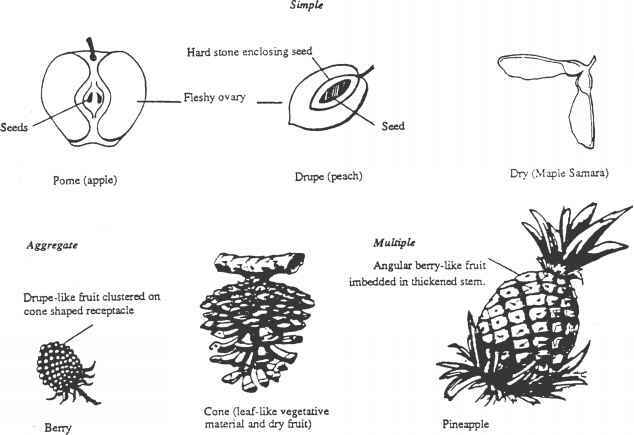 Examples of fruit types. of dispersal. Maple seeds (samaras) are carried through the air on wings. Cockle-burs have barbs or hooks to catch in clothing or animal fur. Small animals gather, transport, and bury nuts, completing the planting of these seeds. These seeds pass through their digestive tracts of animals, such as coyotes, and are widely disseminated. Parts of a seed: Every seed has three basic parts: an embryo, a food storage tissue, and a seed coat (Fig. 16). The embryo is a tiny plant formed during fertilization. It has two growing points, the radicle (a tiny root), and the plumule (a tiny shoot). The food storage tissue is either one or two cotyledon, which are attached between the two growing points on the embryo. In some seeds (as in corn) the single cotyledon is imbedded in an endosperm that is a food-storage area in the seed. The seed coat forms the outer layer and provides protection for the enclosed embryo. Seed viability: In order for seeds to grow, the embryo must be viable, or alive. Seeds can remain alive for days or years, depending on the species of plant and the seed storage conditions. Best storage conditions for most seeds are cool and dry. However, seeds of tropical plants will dry out and die if stored under dry conditions. There are several ways to test if seeds are alive. Cutting open the seed to view the embryo can tell you if it ex ists, but not whether it is alive. Seeds that float on water are usually not viable; live seeds will sink. Germinating a sample of seeds can tell you what percent are alive. Make sure seeds tested in this way are not dormant. Using a chemical such as tetrazolium that stains the live parts of the seed red is a good viability test. Removing the embryo from the seed to observe growth in artificial media such as agar is another way to test viability. For home gardeners these last two tests are usually not practical. c. Seed dormancy: Some seeds, even though viable and planted under the correct conditions, fail to grow. These seeds are exhibiting a feature called dormancy. Seed dormancy can result from limiting structural or physiological conditions in the seed coverings (particularly the seed coats) or in the embryo itself, or both. Dormancy is an adaptive feature of some plants to keep the seeds from germinating until conditions exist that favor seedling survival. with sandpaper or nicking it with a knife. Heat treatments using boiling water can disrupt the seed coat enough to allow germination. Soaking seeds in concentrated sulfuric acid, called acid scarification, softens the seed coat to help overcome seed coat dormancy. Embryo dormancy is common in seeds of woody perennial plants. A physiological condition in the embryo prevents it from growing. This type of dormancy can be overcome by stratification, or chilling seeds under moist conditions. This method mimics the conditions a seed might endure after it fell to the ground in the fall and went through a cold winter on the ground. This type of dormancy keeps the seed from growing in the fall when the resulting tiny plant would be killed by the winter cold. Some seeds have both a seed coat and embryo dormancy. Treatment to overcome both types of dormancy is necessary to allow germination. Some seeds fail to germinate because of an immature embryo. Enough time after seed harvest must be allowed for the embryo to develop. Embryo maturation can occur while the seed is in storage or after it is planted. Chemical inhibitors can block germination in seeds. These chemicals may be in the embryo, some other part of the seed, or even in part of the fruit. Removing the seed from the fruit will allow germination in the case of chemical inhibition from fruits. 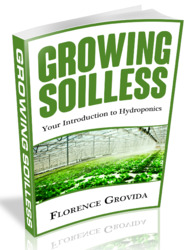 Water leaching can remove chemicals in seeds or embryos. In nature, heavy soaking rains would accomplish this task and provide an excellent growing condition for the resulting seedling. Good reference materials are available to determine what conditions are necessary to germinate a seed. Master Gardeners should use these references to be successful in seed collection and germination. Seed germination—After planting, certain processes begin in a seed leading to the growth of an entirely new plant. These processes are called germination (Fig. 17). The first step necessary to begin the process involves the absorption of water or imbibition. The seed swells with the uptake of water, cell enzyme activity increases, growth begins, and the seed coat bursts. The radicle, which will develop into the root, emerges and grows downward into the soil. The portion of the seedling between the radicle and the first leaf-like structure is the hypocotyl. The seed leaves or cotyledons are usually the first leafy structure seen, and they enclose a growing point called the apical or shoot meristem (defined below). Plants with one seed leaf are monocotyledons while dicotyledons have two seed leaves. The storage products within the cotyledons provide energy to support growth of the seedling until photosynthesis begins. New leaves and stem cells are produced and the plant begins to grow taller, or elongate. Germination of A Dicot Fig. 17. Seed germination. Successful seed germination requires certain environmental conditions: adequate moisture, proper temperature, good aeration, darkness, or, in some cases, light. Differentiation and maturation—Plants continue to grow and develop their structures from meristematic areas (Fig. 18). Various cells form the shape, size, and characteristics of each type of plant. The genetic information that dictates all cellular processes is called DNA (deoxyribonucleic acid). DNA is organized into chromosomes. The order and organization of the DNA in the chromosomes is responsible for all characteristics of the plant—such as whether it will be woody or herbaceous, annual or perennial, or tall or short. Meristematic areas and growth—Plants have specific meristematic areas where cells actively divide to provide more cells that will expand and develop into other tissues and organs of the plant. Fig. 18. Parts of a vascular plant. the epidermis and the very first xylem and phloem. In some plants, this meristem will produce flower buds at a certain point in the development of the plant. In other plants, this meristem continues to produce only vegetative structures (leaves and stems). If this is the case, flowers are produced on side branches in the axils of leaves some distance below the apex. The shoot meristem allows the plant to grow and increase in height. Another type of apical meristem is the root meristem, located at the tips of roots. The root meristems provide for elongation of the roots and produce the cells that will become the epidermis, cortex, and the xylem, cambium, and phloem of the mature root. Lateral meristems: Lateral meristems are cylinders of actively dividing cells that start just below the apical meristems and are located up and down the plant. One type of lateral meristem is the vascular cambium, which produces new xylem and phloem. Another lateral meristem is the cork cambium, which produces bark on older stems and roots. The stem girth of woody perennial plants increases by the activity of these meristems. Other types of meristems: Some plants have a subapical meristem that produces new cells in the region just behind a shoot meristem. Plants that form rosettes when they first produce leaves and then "bolt" when producing a flowering stalk have subapical meristems. An example is common mullein. The subapical meristem aids in formation of the flowering stalk. Some other plants, mostly monocots, have active meristematic cells in older mature tissue, separated from the shoot meristem. For example, grasses have intercalary meristems just above the nodes in the lower region of the leaf sheaths. These cells divide and provide the growth of the grass leaf from the base. How do lenticels take in carbon dioxide? What is a node on a cucumber plant? How to identify leaf shapes? How to describe plant leaves? What the parts of a cucumber? How to identify leaves by shape? What are the parts of a vascular plant? How do photosynthesis produces carbohydrates? Where is the stem girth in beans plant?